Searle’s Auto Repair started out as a one mechanic operation in 1979. Over the years, Ken Searle’s reputation became known for quality work. 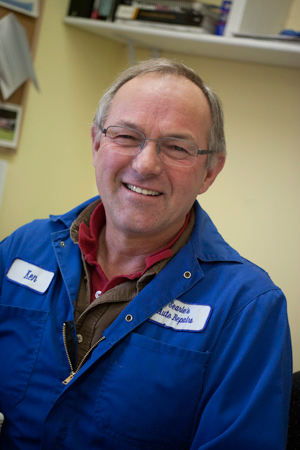 As the years went by his family run business steadily grew from one mechanic to what is today, employing 8 mechanics. Searle’s Auto Repair, located at 517 Kelvin Rd, has two floors and is still known by many for its quality work and honesty. Whether you are male or female, you can put your trust in Searle’s. We take our time in explaining what needs to be done, step-by-step. We feel it is our duty to treat you as one of the family. We understand that without our customers trust; we would not have a growing business. Our mechanics happily work on all makes and models of vehicles, are trained in cutting edge diagnostics and use the latest tools to get the job done efficiently and correctly. Contact us to arrange an appointment for an estimate on servicing and repairing your vehicle. Searle’s Auto Repair is a member of the Better Business Bureau and AUTOPRO GROUP, that allows us to provide our customers with a Nationwide Warranty and complementary Roadside Assistance Program. We have been servicing our customers for over 30 years and we take pride in our reputation, which, in turn, means we treat our customers right.